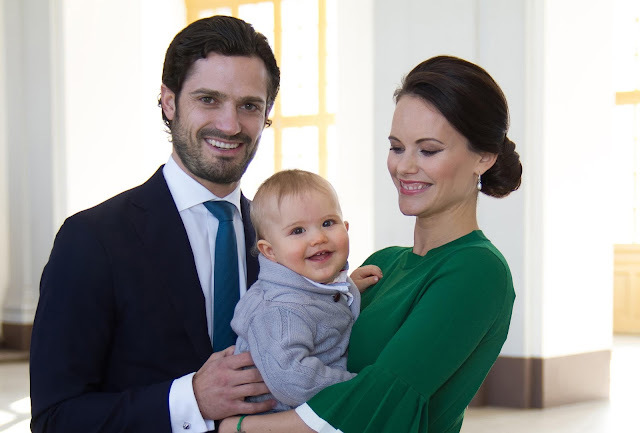 In 2015, Crown Princess Victoria announced her second pregnancy the day of an official dinner at the palace. When she showed up for the dinner, there seemed to be a reason for the timing of the announcement: she simply couldn't hide it any longer. So yesterday was a bit of repeat show. ...yup, that announcement came just in time. This is one of Sofia's best gala gowns so far, which is why I am so glad she saved everyone from the speculation. She also made her second appearance in the Cut Steel Bandeau. I'm gonna say diamonds would have been better and rubies would have been better yet. The dress is screaming for the Edward VII Ruby Tiara, at least as a necklace. 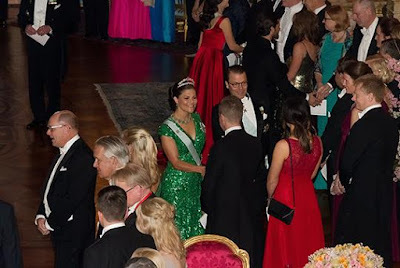 Two airy tiaras with nature motifs rounded out the group: Crown Princess Victoria in Princess Lilian's Laurel Wreath Tiara, which she inherited from Lilian in 2013, and Queen Silvia in the looped forget-me-not garland of the Connaught Tiara. 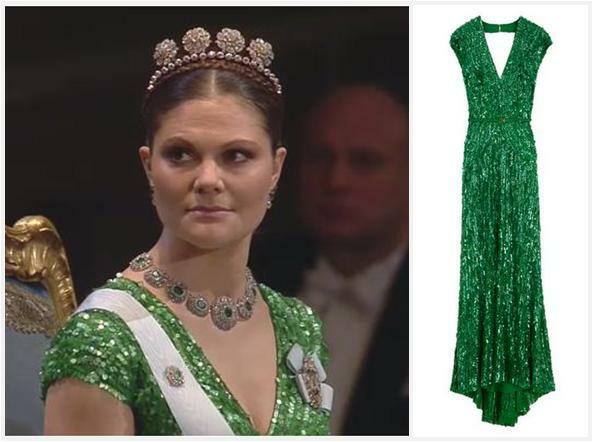 Victoria gave her Nobel 2012 appearance a do-over, once again sporting that Elie Saab number which has been so lovingly dubbed the Kermit Dress by many of you (we're going with "lovingly"), and the Bernadotte Emerald Necklace. She's swapped the Four Button Tiara for Lilian's Laurel Wreath Tiara this time, and WOW does that make me love this look so much more. My fondness for her using the Bernadotte emeralds again and my affection for her making Lilian's Laurel Wreath a regular part of her tiara rotation are strong, but boy, my aversion to the Four Button is eternal. Check out a gallery from the evening here, or a quick Instagram video of the royal family arriving here.